A prism is a polyhedron with two parallel and congruent polygonal bases, All lateral faces (or sides) are parallelograms. Lateral faces meet in line segments called lateral edges. A right prism is one whose lateral faces and lateral edges are perpendicular to its bases. 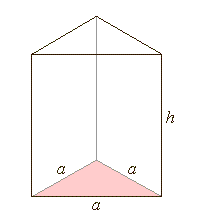 The lateral faces of a right prism are all rectangles, and the height of a right prism is equal to the length of its lateral edge. A regular prism has regular polygons as bases and has all sides equal in length and all angles equal in measure. 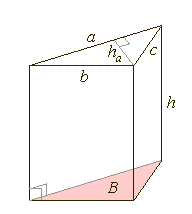 A right regular prism is one with regular polygon bases and perpendicular rectangular lateral sides. 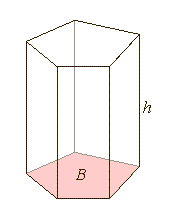 RIGHT TRIANGULAR PRISM: A right triangular prism is made of two triangular bases and three rectangular faces with lateral edges perpendicular to the bases.